Yesterday morning we had the absolute and unmatched joy of announcing our pregnancy. I can’t say it wasn’t without some nerves on my end, however. You see, we’ve known about this sweet growing baby since it was just days (and atoms) old – too microscopic to even register on a home test. It feels like this happy little secret we’ve been anxiously and excitedly carrying with us (and shared among a very few, close friends whose ranks grew as the weeks accumulated). When we were finally one day away from sharing it in a general sector, I suddenly had these crazy fears that maybe it was all a dream or I was making it all up – or like I might get in trouble – you know the age-old story… happily married wife gets pregnant following a nearly two year battle with infertility – the stuff of scandal and trouble, without a doubt. But instead, when my trembling hands hit publish on our little gingerbread family Christmas-scape and the messages and likes and comments and love came pouring in, we were overwhelmed by the collective love and support surrounding our very tiny, little Biscuit growing away inside me. Our pregnancy came about as a result of an IUI, and I honestly couldn’t believe it. We were flanked by an incredible team at REACH, a local fertility clinic, who walked beside us every step of the way. When we first met with them I was concerned that after all of the testing and assessments that we would be told, yet again, to give it a few more months of trying. Much to my delight, led by our doctor, Dr. Wing, and his absolutely wonderful nurses, it was agreed that we would proceed immediately to IUI. We agreed together that we would undergo three rounds of IUI, and if none succeeded, we would move on to IVF. Each round of IUI carried a 15% success rate with it – lower than a couple’s chance of naturally conceiving in a given month. Our first round wasn’t particularly ideal – during our appointment that was meant to measure, count and track the progress of my eggs, following a five day round of fertility medicine, and determine when to administer the “trigger shot” that would force and sync my ovulation for an ideal insemination, we discovered that I only had one mature egg (more are preferred) and my body was beginning ovulation on its own. We knew that to get that round in, we needed to do it that day. Afterward, the dreaded two week wait. Knowing that our circumstances were less than ideal and having been, at that time, through 22 of the same waits (that’s 44 weeks of waiting, y’all), I thought it would be easy. And the first week did pass by without much thought or anguish about what might or might not be happening inside me. But, Dr. Google beckons, as he always does in his wily way, and I discovered through Nurse Message Board that several people had received accurate answers from a home test a mere 9 days post-IUI. So. At 9 days post-IUI, I tested. Davey and I had given ourselves the pep talk that we wouldn’t be disappointed if it were negative because it was still too early to really to test, but since I hadn’t taken a trigger shot, a positive would, in fact, be positive, not a false, tricky minx. Yet, when the test was negative, we both carried heaviness with us that evening. Then when I secretly tested again at 10 days, then 12 days, and began cramping and having my typical premenstrual symptoms, my hope diminished, and in fact, nearly extinguished. But, by day 14, which was the day before our second anniversary, and I still hadn’t started my period, I became perplexed. We had been instructed to take a home test that morning if I hadn’t started, so I woke up extra early on that Sunday morning in April to test – convinced that I’d be greeted with an unmistakeably positive sign. So I peed my little bladder out, stared at the testing window… and… nothing happened. It was negative. Again. Resignedly, and bitter that my body waited until THIS month to start the cycle late, I placed the test on the counter and got back in bed, sadly letting David know that it was negative. When he slid out of bed about 10 minutes later I asked him just to look at it and see if something had magically appeared while I had taken my eyes off the pot boiling, so to speak. “Ummm,” came the voice from the bathroom. “I mean, it’s not positive. And I don’t know if it’s because I know where to look and what I want to see, but there might be something there. But also maybe not.” I sprung out of bed, and together we stood hovering over the test alternately squinting, moving the test under more light, then less light, then cocking (haha, what a weird verb) to each side, trying to decipher the line that wasn’t there but also might be. At that point I decided to call the professionals. I left a message explaining that I had achieved neither a period, nor a positive test, sooooooo… um…. yeah. They told me to come in for a blood test, then several hours later called me with the news. “Caroline, we ran your bloodwork, and it came back positive for a pregnancy, but… the hormone levels are lower than we’d like them to be… about half of what home tests pick up. We want you to come back for more bloodwork on Wednesday, and we want to see that number increase from 12 to 80.” I honestly didn’t know how to feel. Excited and ecstatic but with a huge asterisk beside it. I was like the Barry Bonds of pregnancy. Baby Bonds. Before our first anniversary, David and I agreed that we’d buy each other gifts based on the traditional categories each year. Paper for the first, cotton for the second, and so on and so forth. The day after our IUI, I’d picked up a little pack of onesies and stowed them in a closet jusssst in case things went our way. He was in the shower when the call came in, so I hurriedly wrapped up the onesies and ran up to the bedroom. I shakily told him something about giving him a gift a day early to take to work, and as he unwrapped them, equally shakily, we just hugged and cried. A perfect cotton present. But then, there was the but. The wait until Wednesday was nearly as excruciating as the two week window, not knowing whether to celebrate, whether to steel myself for disappointment or just breathe. We even decided that I’d take another home test a couple days after the one on Sunday to see if the line had darkened at all. It had, possibly, and only because we wanted it to so badly. When the call came in with the results on that Wednesday following the blood draw my whole body went numb, while one of the angelic nurses excitedly told me that the number had improved to 103. I felt all of the tension I’d been holding for three days leave my body while I called Davey and told him that, yes, indeed, we were having a baby, then spread the news to three of my best friends. We had one more blood lab to confirm that the number was still climbing then ultrasounds at 6 and 7 weeks, where we got to see this biscuit and hear its precious little heart beating. So. That’s where this baby comes from. When two people love each other very much, they hug, then nothing happens, then they hug again, then still nothing, then they call a doctor, then the doctor helps out with a magic tube, then a baby grows. And some time along the line – week 10 or 11 or some such, I made these salads for myself and my sis (henceforth to be known as Aunta Beth) after a particularly challenging yoga class, and we’ve talked about them nearly daily since. And the baby too. In a crockpot, place chicken breasts, garlic and onions. Whisk together lemon juice, olive oil, vinegar and Greek seasonings and pour over chicken. Add water to cover chicken and cook on low 4-5 hours. Shred chicken. 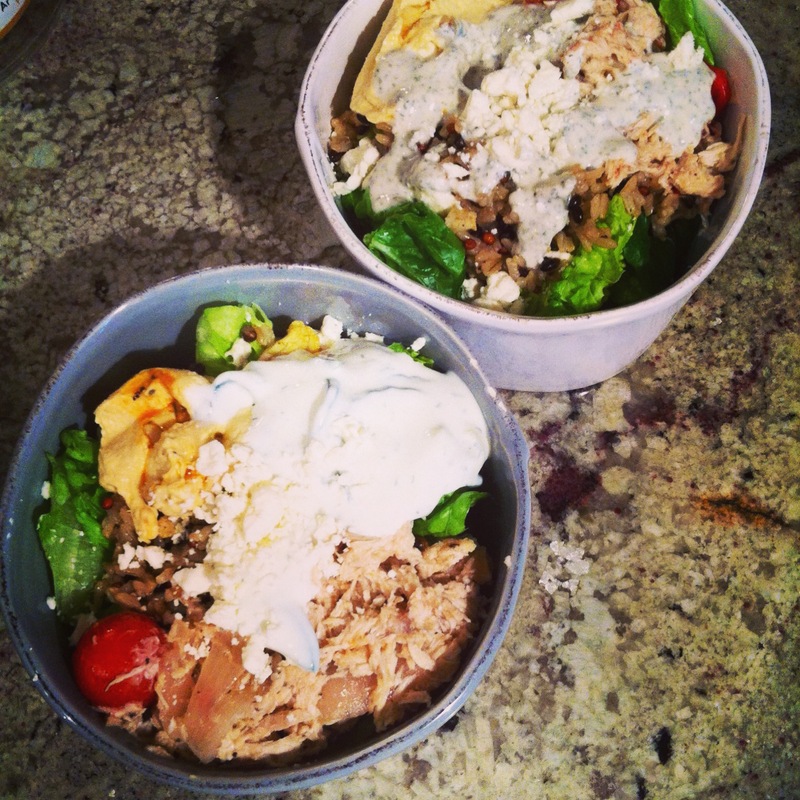 Assemble romaine, feta, tzatziki, hummus, tomatoes and top with brown rice and chicken. ummmm, i didn’t think i could be more excited than i was, but i think i am now. yay for hugs and magic tubes…and a really great set of parents-to-be! !